Are you planning to visit Disney’s Magic Kingdom park for a day? Plan ahead and get the complete guide to watching parades at Disney World! One of my favorite ways to relax at Disney is to sit around and wait for shows. Chris’s idea of relaxing is to either head back to the resort or head for a ride, so we sometimes go our separate ways when it’s time for the parades. But I’m pretty adamant about watching them each time we go (mostly because I love photographing them!). 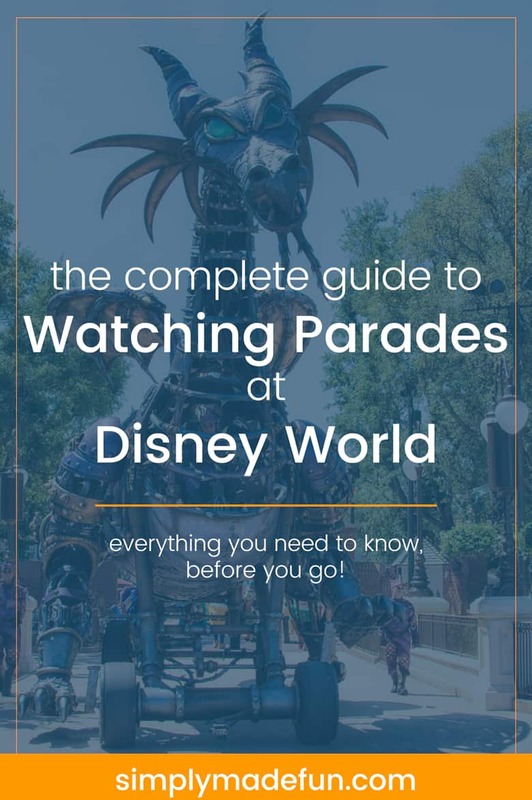 And because of that I’m able to put together the complete guide to watching parades at Disney World for you! When you’re thinking of watching parades at Disney you’re probably wondering where to watch the shows from and what times you need to get to them for a prime spot. Don’t worry, I’ve got all the info (and more!) in one place for you. 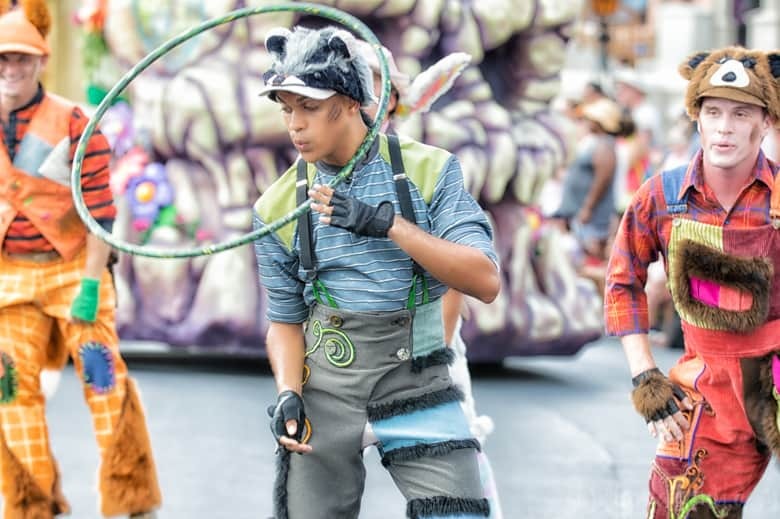 Want the Complete Guide to Watching Parades at Disney World? Read More Below! + For parades I try to show up about an hour beforehand to get a good spot. Especially if I’m taking pictures. Stake your claim at a front row spot early because there will be a ton of people who try to push past you just a few moments before the show starts. So always try to get there early if you want the best spot. + For shows on the Castle stage I tend to do the early afternoon show (the 1:00pm show is the one I did on our last trip) and have shown up about half an hour before it starts and have always gotten the spot I wanted. During the busy season you may have to get there a little earlier if you want a front spot but, to be honest, watching from a little further back is still fine because the stage is raised and you’d still have a good view! Where should you watch the parades from? There are many places at the Magic Kingdom to watch the parades from, it just depends on what parade you’re seeing and what comes after it. We’ve come up with a few favorite places to watch the shows from, and one or two places that I’m really not fond of. Please keep in mind that I tend to think of what spots would be best for photography shots, so my picks may be a little different than what other people would choose just because of that factor! + Main Street USA is always a great place to shoot parades from! It is the place that seems to fill up the fastest so getting here an hour early is a must. But for the mid-day Festival of Fantasy parade the shops do provide a little bit of shade (especially if you sit on the side with the Emporium shop). + The top of the Train Station is another pick for me. The only problem with this is that they have removed the tables and chairs that used to be on the platform and replaced them with built-in benches, so while we used to be able to sit on a chair in the shade you cannot do that anymore. I still highly recommend this spot because watching the parade from a higher viewpoint is nice (because no one is blocking your line of sight) and you can stand in the shade. + In front of Walt’s bench is probably my absolute favorite place to watch the parade from. If you get there right at an hour beforehand you can snag the front and center spot (usually) and the pictures always turn out amazing. You get the castle right in the background and the characters are coming right at you which is nice. For the nighttime parade, the characters like Cinderella are usually in carriages so it’s sometimes a hit or miss if you’ll be able to get a clear view or picture of her (it depends on which way she is looking when she gets to you). But that is also true no matter where you’re sitting. You never know if a character will look your way or not! + In front of the Castle is a great spot if you have little kids. It’s not my favorite spot for taking photos (I tried it out on the last trip) but there is something incredibly magical about watching the characters float by with Cinderella’s Castle in the background! + Across from the bridge by the castle is my second favorite spot to take pictures from! It gives you a clear view of the characters with little to no people in all of your shots. This is another spot that fills up quickly so getting there an hour before the parade starts is essential to getting the spot you want. + Frontierland is the best spot to watch the parades from if you don’t want to deal with a lot of people or deal with getting there early. Most people like watching the parades with the castle in the background, so if that isn’t important to you then Frontierland is a great place to watch from! + If you’re a photographer I highly suggest shooting the shows and parades with a long-range lens with a high aperture. For our last Disney trip I rented a Sigma 50-100mm F/1.8 Lens for Nikon, which captured great photos but I will never rent the lens again. It was incredibly heavy and it was hard to hold up throughout the shows. Next time I’ll try the Nikon 70-200mm f/2.8 Nikon Lens (which I’ve heard is also heavy) and see how the photos turn out! I hope this complete guide to watching parades at Disney World is helpful for your vacation planning! If you’re heading to the park, make sure you catch Disney’s Electrical Parade before it ends its run on October 9th, 2016! Because it’s coming to an end so soon you’ll want to get to your spot for this parade more than an hour early, everyone will be cramming in to see the last few shows! Do you love watching parades at Disney World? Where is your favorite place to view them from?